It’s interesting to see how this has developed over time on your blog. The visual appearance has changed a bit so the relationship between the various elements is less apparent now. So, is there any relationship (in difficulty or anything else) between Expl. Build. Conn. (from left to right) OR… from bottom to top within each? Exploring, Building & Connecting are effectively reading, writing and participating on the Web. 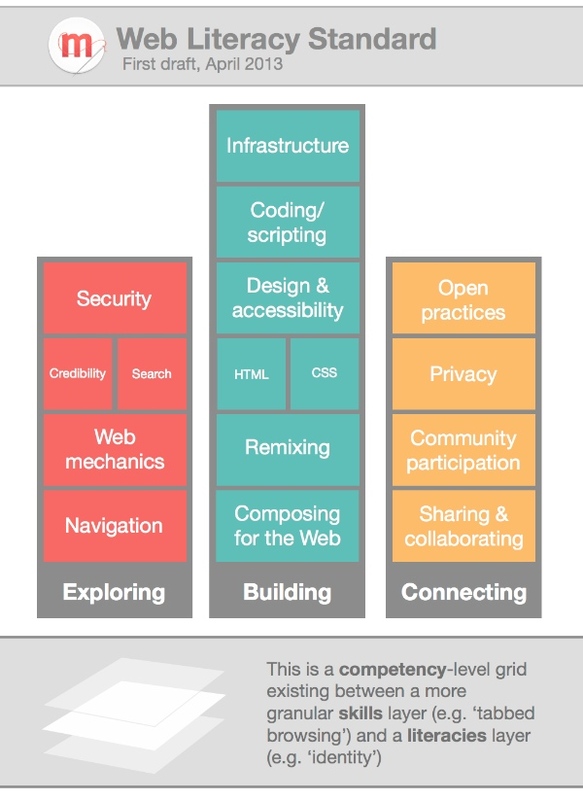 So, the constituent parts of ‘being literate’ when it comes to the Web as a platform. In terms of ‘difficulty’ there’s an implicit levelling-up as you move up each strand. I don’t want to make that *too* explicit at the moment, however, as it might not be the same in all contexts! It looks pretty comprehensive to me and definitely a work longly postponed and necessary. I have some problem identifying where the use of CMS would fit. It doesn’t seem to fit that much in Composing for the web from a user perspective. So, ‘using a CMS’ is actually a collection of Web Literacy skills, I’d argue. should be well enough written that it deserves to be fully understood. Hi Roland, thanks for the comment. The nice thing about the Web Literacy standard is that it’s bounded by what is or is not ‘the Web’. We’re deliberately pitching this at the Beginner/Intermediate level as, I’d argue, learning what a Web browser *is* and how to get online prefigures all of this!